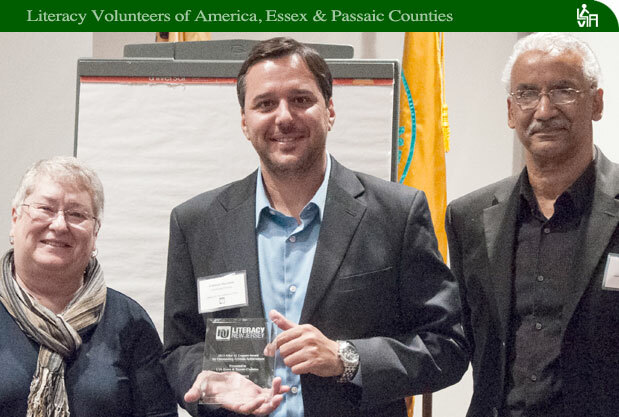 LNJ 2015 - Literacy Volunteers of America, Essex & Passaic Counties, NJ Inc.
Literacy Volunteers of America, Essex and Passaic Counties has been successfully training tutors for years. They come out of the gate ready to go but many are left wanting more. To further assist our tutors, two years ago we launched a pilot program, our monthly Tutor Support Workshops. Topics range from the state of adult literacy in New Jersey to using the lyrics of folk songs to teach vocabulary and comprehension to adult readers. The workshops provide a forum in which tutors can ask questions of other tutors, teachers, and professionals and receive feedback on techniques used in class. As an extra perk, our workshops evolved into a close-knit support network for our volunteers. Most tutors have said they have found the workshops to be extremely useful and help them implement best practices. Over the past two years, statistics show that student hours with their tutors have increased over 200%; student test scores are up 50%; and student retention for more than a year has increased 20%. Our students are more motivated and better prepared for the workplace, which in turn improves the quality of their lives. This year Literacy New Jersey honored the program with the Alice M. Leppert Award for Outstanding Affiliate Achievement. A shy young woman, embarrassed to ask stranger for a bus schedule when she first came to the United States, Peruvian born Andrea Mego has become a confident individual. "I was brought to the US with my family because I did not want to leave my mother and sister alone in a new country. Now, I am the head of my family. This situation has made me stronger and I know I have to depend on myself." Andrea took it upon herself to assist her mother with everything from filling out forms at the doctor's office to guiding her through the complicated application process that leads to US permanent residence. Since she began this arduous task a year ago, both Andrea and her mother have received their green cards and most recently Andrea attained her driver's license. In June of 2015, Andrea began her ESL studies with LVA in our satellite program with Berkeley College. She advanced so quickly that now she has become an LVA office volunteer, is the Spanish language coordinator of the English-Spanish Language Exchange, a pilot project she helped launch for LVA, Essex and Passaic counties. Recently, Andrea was awarded "Student of the Year" by Literacy New Jersey where she gave a speech and brought the audience to their feet. Andrea plans to enroll in college and continue her studies in journalism. "I see writing as a way to get a positive message out to other immigrant who are trying to find their way in a new country." Congratulations to Andrea who this year received the prestigious Literacy New Jersey Award for Student Excellence.